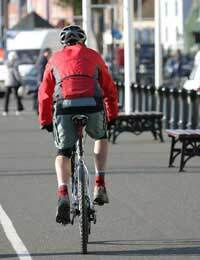 Home > FAQs > Is it Better to Cycling to Work? With 4 million people in the UK driving less than three miles to work, it‘s time more commuters cut down on CO2 emissions by hopping on a bike instead. To help ease the concerns about such a prospect, we answer some frequently asked questions about the cycle commute. What Are The Benefits of Cycling to Work? Not only by opting for a bike over a motor vehicle do you help the environment by cutting down on CO2 emissions, but it’s also good for you health. Commuters that arrive into work by bicycle are likely to be healthier, fitter and more on the ball than their non-biking colleagues. Not only that but regular exercise halves the chances of heart disease and helps protect against strokes, diabetes and certain cancers. Cycling to work is a much more convenient way to get your regular exercise because unlike going to the gym or swimming baths, the commute is already a part of your daily routine. It Might Be Healthy But at the Same Time isn’t it Dangerous? According to the Department of Transport’s statistics, in the last three years cycling has actually proved a safer way to get from A to B than walking. What’s more the greater the number of cyclists there are on the roads then safer it becomes, because motorists become accustomed to watching out for bicycles. It sounds like a wide sweeping statement but it is supported by facts – the increased number of cyclists in London over the last ten years has led to a 50% drop in cycling casualties. Won’t I Be Damaging My Health By Breathing in Motor Fumes? The level of pollution for cyclists is lower than you would think. For instance, on hot humid days when pollution in the atmosphere is at its height, cyclists are actually exposed to less pollution than those commuters sitting in their cars. I’m Nervous About Cycling on the Roads – How Can I Boost My Confidence? Bikeability is new government initiative to teach children the skills and confidence to cycle on the roads. It is also available to adults and regardless of whether you are a beginner or old hand, it can prove effective in helping boost your road confidence and safety awareness. Don’t I Need to Buy Lots of Special Gear? No. The only things you really need are a bike, a lock and some lights. The lycra suits you see some cyclists wearing are unnecessary unless you’re set on breaking commuting speed records. There’s nothing to stop you commuting in your work suit, as is common in any bike-friendly city. Even a helmet isn’t compulsory and their benefit to the safety of cyclists has not been totally proven. But Bikes are Expensive – How Can I Afford One? The government has introduced an incentive scheme, known as ‘cycle to work’, which means employers can help their staff save money by acquiring tax-free bikes. What Else Can My Employer Do to Encourage Me to Cycle to Work? If you gather together other cycling work colleagues to form a bicycle user group then your employer might support your noble cause by providing proper facilities, such as showers and safe place to lock up your bike. If they’re very serious about reducing their transport carbon emissions then they can even have a cycle audit carried out. This will assess aspects such as your company’s transport needs, budget and staff attitudes and then offer advice on what initiatives to introduce to encourage cycling amongst staff, as well as guidance on the necessary facilities. By actively enticing employees out of their cars and onto more sustainable modes of transport, your company is demonstrating that it is concerned about the environment, the health of its staff and is committed to seeking greener working practices. Won't My Bike Get Stolen? Good parking facilities at work will certainly provide peace of mind. Other than that you will have to rely on a decent lock and sensible parking spot. The bike should be locked to something solid and permanent, and be a public place where it can be easily seen. Choosing an undesirable looking bike will also help deter would-be thieves.